If you are interested in learning more about your health and wellness, save the date for our 2019 Health and Wellness Fair on January 12. 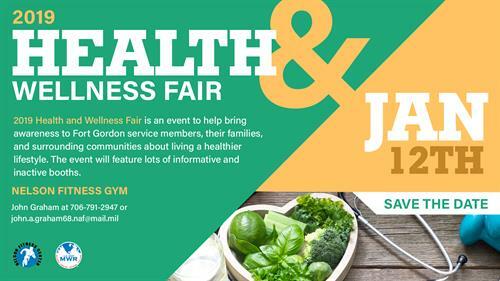 This event will bring awareness to our Fort Gordon service members, families and the surrounding area about how to live a healthier lifestyle. The event will feature informative booths, as well as, interactive demonstrations. If you would like to participate as a sponsor or demonstrator, please call 706-791-2947. Jan 12 2019, 10 a.m. - 1 p.m.